Syros, found at the center of the Aegean islands, may be keeping a low profile compared to some of the Cyclades, but for those looking for hidden gems, a profound and vivid piece of history awaits to be discovered beyond the island’s astonishing beauty. Syros is a 5,000 year old strenuous tale of fall and recovery, to becoming one of the ‘sweetest’ and most interesting destinations in Greece today. From the hillsides of Ano Syros you can see many surrounding Cyclades islands such as Tinos, Mykonos, Paros and many more! The north part of Syros is the island’s wildest side with limestone rocks covering most of it, making it inhabitable. 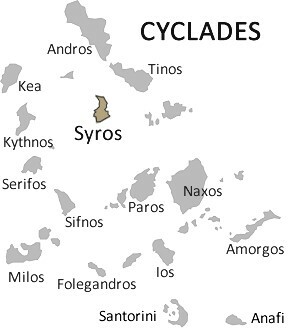 In total contrast, the south side of Syros is flat and home to most of its settlements, as well as its capital, Ermoupoli, which is also the capital of the entire Cycladic complex. Lively even during the winter months due to its active public sector and university, Ermoupoli is one of the most historically rich towns of the Aegean and the point of reference when talking about Cycladic maritime economy, architecture and culture. You can enjoy Syros by birthing into any of its two main ports (Ermoupoli & Finikas port). From there you can discover beautiful neighborhoods, kind people, lots of small shops right and left the paved streets, neoclassical mansions and narrow alleys that only pedestrians can access. *Tip: Although there is an urban transport network, we would suggest that you rent a car and visit every corner of the island even within one day. The island is small and it won’t cost you more than €15 of fuel to explore it, while the rental cost is about €30 for a small city car. You can call Ms. Popi Stathopoulou at +30 6936691543 who can accommodate you anywhere on the island. Ermoupoli port, located on the east side of the island has a capacity for 100 vessels and is protected from winds of every direction, but watch out for the south-eastern ones. Docking costs are around 3 euros per day for vessels up to 40ft, while supply costs are at 10 euros for 200lt of water and 200kW of power. 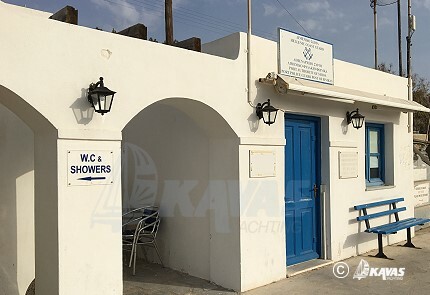 With no additional cost you will also have access to the marina’s showers and restrooms. Ermoupoli’s port is in close proximity to the town, electrically lit and connected to the fire department network. If you encounter problems with finding a location, the person in charge is Mr. Loudaros (mob. +30 6932644072) who will be more than happy to make arrangements for you. Found on the west side of Syros, Finikas, with a capacity of 40 boats, is a small marina in a picturesque place, perfectly fitting those who enjoy listening to the plop of the sea in peace and quiet. Docking and supply costs are somewhat lower than Ermoupoli’s port while free wifi, showers and restrooms are all included! Within walking distance of the marina you can find the beautiful beach of Finikas as well as a charming fish tavern where you can enjoy fresh prey and even get a little (or a lot) Tipsy as your boat will be no farther than 50m! Average compared to Greece’s median, your vacations in Syros can prove well worth the money spent on it. For 5 euros you can get a full breakfast while lunch for 2 at a traditional tavern won’t exceed the amount of 15 euros per person. Expect your grocery shopping to be around 20 euros for essentials but don’t forget to also buy exquisite, traditional loukoumia! (delights). Cocktail prices might be a bit higher during the summer months at around 9 euros each! One of the liveliest parts of the island, along the harbor pier you will find coffee shops, pizzerias, restaurants and bars where you’ll discover just how quickly time flies when you’re having fun. Ermoupoli is a very beautiful town and will definitely lure you to endless strolling. Surely, you will only return to your boat late at night, looking for some shut-eye. But if you’re a party animal, a nice idea would be to take your drinks to the cockpit and relax for a while, joining many others from nearby boats. By venturing farther away from the waterfront (only 50m) and going a bit deeper into the town you will find even more options for food or drinks. You will also find clothes-shops, bookstores, the fish market and so many more wonders! Just 130m from the harbor you will find the Town Hall and if you are lucky you might get to watch bits of the frequent cultural events taking place in the courtyard in the afternoons! One of the most picturesque corners of the island, Ano Syros is a medieval settlement with more than 8 centuries of history, built on the rocky hillside of the island. If you have not rented a car, grab a taxi and then climb up the many steps through the crisp white houses and their arches until you reach the catholic church of Saint George that commands an unparalleled view of the harbor from its hilltop. On your way down and looking for refreshments? 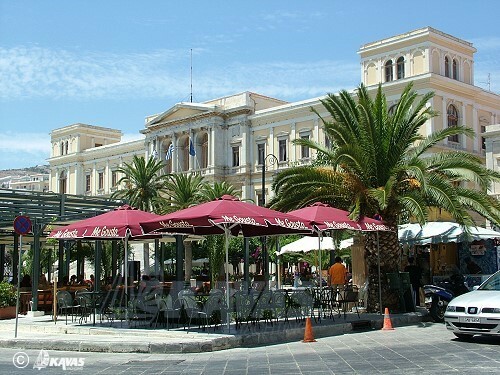 Make a stop at one of the traditional cafés for some water or a cold beer but don’t forget to order some loukoumia too! Once you’re rested and ready to move on, it is worth visiting the museum of Mark Vamvakaris, a cultural figure who invigorated Greek folk music with his bouzouki, giving Greeks an immense heritage. In the museum you will also have a chance to see and an exhibition of rare collectibles, a reference to traditional professions that have since disappeared. Built in Ermoupoli in 1864, following the paradigm of Milan's Teatro alla Scala, the Apollo Theater first opened its doors presenting Verdi’s Rigoletto and went on to host more grand operas like La traviata, Donizetti’s La favorita, and Gide’s Les faux-monnayeurs. After the ruin of the second world war and its restoration, today the theater hosts various cultural events and festivals such as the Aegean Festival, the AnimaSyros International Animation Festival and the International Festival of Classical Cycladic Music. Some of the most important contractors, architects, engineers, sculptors and painters contributed to the architectural magnificence of Ermoupoli naming it "the countess" of the Cyclades. The first signs of architectural progress occurred during the middle of the 19th century by the refugees who settled on the island carrying architectural elements of classicism from the various places of origin. Even today, the visitor can see the now abandoned two-story houses with their stone-plastered walls, the wooden floors, roofs and corners; the balconies, the open verandas, courtyards and external stairs that once connected the two floors. Undoubtedly an exquisite setting for a lazy afternoon walk! Syros is well known for its shipbuilding activity and its role in the development of the Greek Merchant Fleet, manufacturing all kinds of vessels from steamboats to traditional wooden ones since 1861. The shipbuilding geek visiting Syros, will gladly discover that modern merchant ships are still being repaired in Ermoupoli’s shipyard even today! Co-existing beyond different religious beliefs, Syros is a conglomeration of Catholic and Orthodox tradition with mixed marriages being a shared opportunity for festivities! Moreover, Syros is the only place where Orthodox and Catholic Easter are celebrated on the same day with a special permission from the Pope himself. This peaceful coexistence between the two dogmas that started almost 7 centuries ago, has had an apparent effect on the island’s make-up with Catholic churches gracing many corners with their beauty. You should definitely not miss out on a visit at the catholic cathedral of Saint George at Ano Syros as well as the orthodox cathedral of Aghios Nikolas in Ermoupoli! 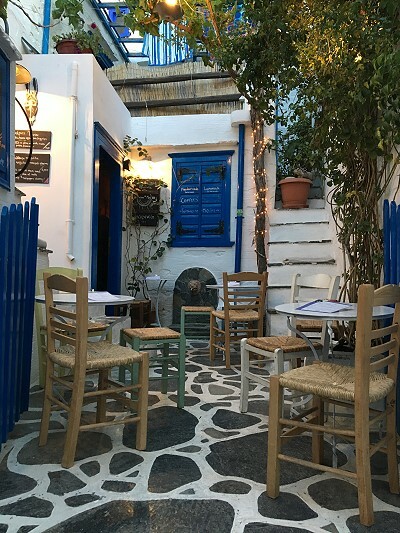 Like on every Greek island, in Syros you will have many chances to savor Greek gastronomy with the famous Greek salad, fresh fish and some ouzo being fundamental to your table. But you should not miss out on getting a taste of their local delicacy, loukoumia, a type of soft sweet that until recent years didn’t miss from any Greek household. loukoumia are made by mixing water, starch, sugar and of course, flavor, their most characteristic ones being rose and mastic. Many more gourmet flavors have been added to the collection since their appearance but you should definitely opt for the most traditional recipes! If you’re looking for secluded bays to drop your anchor, you will find that Syros is wrought with small inlets that look out on some of the most beautiful beaches of the island. Starting from Finikas port and sailing due north you will find the bay of Galissas surrounding the local sandy beach that has been awarded the blue flag for its high environmental and quality standards. Interested for a swim? By continuing north you will also find the bay of Kini where there’s also an organized beach that’s frequently crowded. At the northernmost part of the island you will find the bays of Sikamia with its charming small cave as well as Kastri which, apart from its amazing beach, is also an interesting archaeological site! From there, you can either take the same route back to Finikas or continue your circumnavigation until you reach Ermoupoli! Charter a boat to Syros?